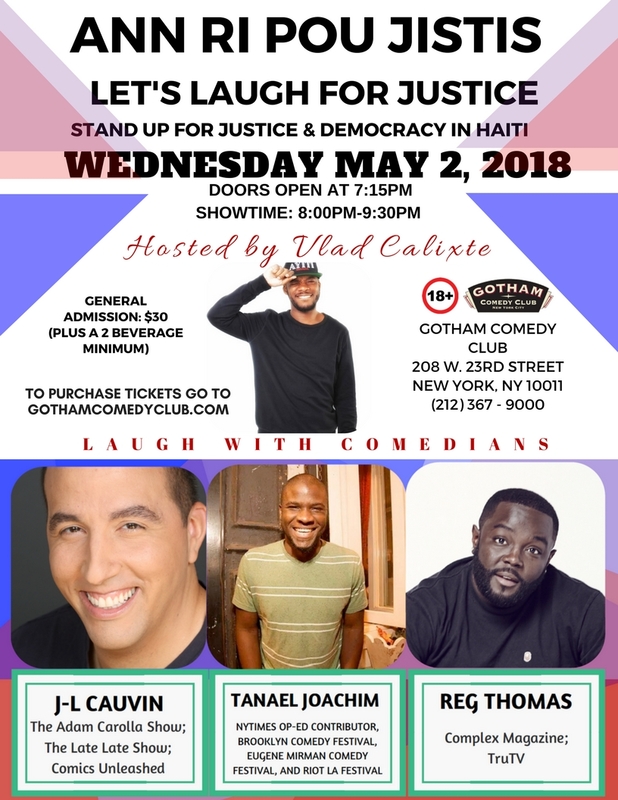 des Avocats Internationaux (BAI) will present “A Stand up for Justice and Democracy in Haiti” with Haitian-American comedians Jean-Louis “J-L” Cauvin, Tanael Joachim and Reginal Thomas at Gotham Comedy Club in New York City on May 2, 2018. Our host Vladimir Calixte, known as Haitian V, will be using his talents to bring people who care about justice and democracy in Haiti together to laugh while championing a worthy cause. All proceeds will benefit BAI/IJDH’s advocacy and legal work in Haiti. Joachim, a native of Haiti, who penned a New York Times’ response to President Donald Trump’s criticism of Haiti, urges everyone to join him in support of IJDH’s crucial advocacy and legal work, especially that on behalf of tens of thousands of Haitians who are currently living under Temporary Protected Status (TPS) scheduled to expire in July 2019. “When you come to this show, all the proceeds are going to a cause that will help defend the lives of tens of thousands of Haitians,” said Joachim. Cauvin, a lawyer-turned-comedian born to an Irish-American mother and a Haitian father, appealed to residents of the New York City metropolitan area to come out and laugh while championing a noble cause. “The good news is that the audience will have a hilarious comedy show,” he said. “It won’t feel like charity work. Folks will be entertained while their tickets go to a worthy cause,” said Cauvin. Empowering Haitian grassroots activists and training Haitian human rights lawyers. “The May 2nd event in New York’s Chelsea neighborhood is an advocacy opportunity too. We will gather people who care about justice to laugh, of course, but also to learn and discuss how we can all stand up for justice and democracy in Haiti,” said IJDH’s Executive Director Brian Concannon Jr. The show will be on Wed., May 2 at 8:00 p.m. at the Gotham Comedy Club, 208 West 23rd St., New York, NY 10011. General Admission: $30 (plus two beverages minimum). Individuals can use the promo code “jistis” for $10 off of their ticket. All proceeds will go to support BAI and IJDH’s legal work in Haiti. Buy your ticket at GothamComedyClub.com. More details visit IJDH.org.